It's puzzle time with Curious George! 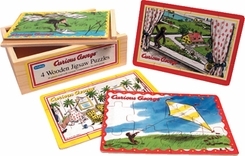 This classic jigsaw set includes four wooden puzzles, each featuring a different Curious George adventure. Pieces are large and chunky for beginner puzzlers. Everything comes packaged in a wooden storage box with a see through top. Ages 3+.